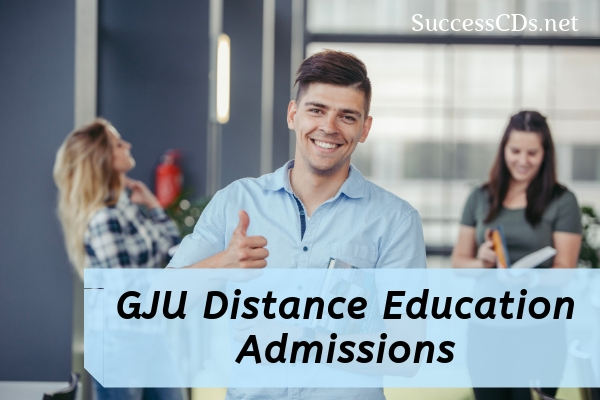 GJU Distance Education Admissions 2019 - Applications are invited by Directorate of Distance Education of Guru Jambheshwar University of Science and Technology, Hisar for admission to the follow in various Undergraduate and Postgraduate Distance Learning Programs for the session 2019-20. Guru Jambheshwar University Directorate of Distance Education (DDE) is known for its highly job oriented and skill specific courses of study. The University offers a wide range of academic programs/courses at post-graduate and undergraduate level. All these programs are designed by taking into consideration the special needs of the market and the industry and the Model Curricula has been designed in accordance with model course curriculum of the UGC/AICTE. Emphasis is laid on both theoretical and practical training, knowledge and skilling for exposing students to the latest developments in the various areas of science, and technology. BBA/B.Com. & B.A. (Mass Communication) - Duration: Three Years; Eligibility: 10+2 or equivalent examination from Board of School Education, Haryana/CBSE or any other Board recognized by Board of School Education, Haryana/CBSE or 3 years Diploma from Board of Technical Education, Haryana or its equivalent from recognized board. B.A. (Bachelor of Arts) - Duration: Two Years; Eligibility: Passed the Senior Secondary Certificate examination (10+2) of the Board of School Education, Haryana/CBSE or an exam as equivalent thereto, with English as one of the subjects. Master of Commerce (M.Com) - Duration: Two Years; Eligibility: Any Graduate from a recognized University or Fellow of ICSI/ICAI/ICFAI/ICWAI/Similar body. Master of Business Administration (MBA)- Duration: Two Years Eligibility: Bachelor’s Degree with 3 years of supervisory managerial/professional experience OR Professional Degree in Engineering/ Medicine/ Architecture/Law/ Pharmacy OR Professional Qualifications in Accountancy/Cost and Works Accountancy/Company Secretary ship OR A Master’s degree in any subject OR Bachelor’s Degree with 50% marks in any discipline (47.5% marks for SC candidate of Haryana) at the qualifying Examination. Master of Computer Applications (MCA)- Duration: Three Years; Eligibility: Bachelor’s degree in any discipline. MCA (5 Years Integrated) - Duration: Five Years; Eligibility: 10+2 or equivalent examination from Board of School Education, Haryana/CBSE or any other Board recognized by Board of School Education, Haryana/CBSE or 3 years Diploma from Board of Technical Education, Haryana or its equivalent from recognized board. PG Diploma in Taxation (PGDT) - Duration: One Year; Eligibility: Any Graduate or Post-Graduate degree from recognized University or Fellow of ICSI/ICFAI/ICWAI/ ICAI. The cost of prospectus is Rs.400/- (Rs.100/- for SC, BC, SBC & EBP of Haryana) which can be paid along with admission fee.